The rites, practices, and texts collected by the mysterious UR group for the use of aspiring mages. Rare Hermetic texts published in English for the first time. Includes instructions for developing psychic and magical powers. In 1927 Julius Evola and other leading Italian intellectuals formed the mysterious UR group. Their goal: to bring their individual egos into a state of superhuman power and awareness in which they could act “magically” on the world. Their methods: the practice of ancient Tantric and Buddhist rituals and the study of rare Hermetic texts. So successful were they that rumors spread throughout Italy of the group’s power, and Mussolini himself became quite fearful of them. Now for the first time in English Introduction to Magic collects the rites, practices, and knowledge of the UR group for the use of aspiring mages. 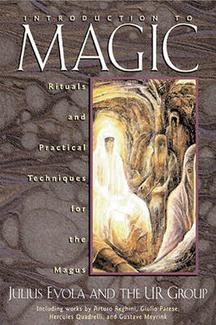 Included in Introduction to Magic are instructions for creating an etheric double, speaking words of power, using fragrances, interacting with entities, and creating a “magical chain.” Among the arcane texts translated are the Tibetan teachings of the Thunderbolt Diamond Path, the Mithraic mystery cult’s “Grand Papyrus of Paris,” and the Greco-Egyptian magical text De Mysteriis. Anyone who has exhausted the possibilities of the mundane world and is ready to take the steps necessary to purify the soul in the light of knowledge and the fire of dedication will find a number of expert mentors here.